I accidentally knocked the top handle of the donabe lid with a glass bottle and chipped it! 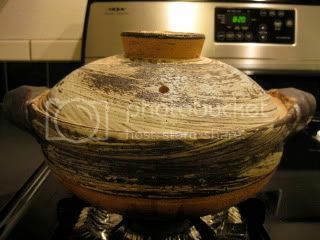 Well, it happens, and let's say it has given another "character" to my donabe. I just need to be more careful next time. It's still totally fine to use. 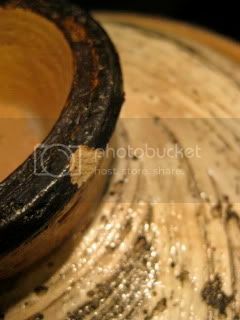 You never want to use a chipped plate, but for donabe, a little chipped part is just fine (as long as it's not a crack). It's getting cooler in LA, so it's becoming a nicer season for hot pot. Last Saturday, I offered another private class for a group of 10 wonderful people. It was a lot of fun. One of the dishes we made was a donabe hot pot dish with chicken and vegetables. 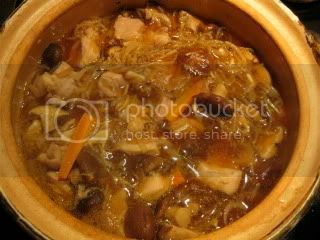 Unlike the pork sukiyaki I often make in the tagine-style donabe, "Fukkura-san", I make this chicken hot pot lighter brothy-style while the flavor is still very deep and soothing. Once all the ingredients are in, it takes only 7-8 minutes of simmering and the dish is ready! So, it's a nice dish to entertain a group of people with easy preparation. 1. Season the chicken with the salt. Set aside. 2. Sauté the onion, garlic, and ginger with the sesame oil in the donabe over medium-heat until the onion is softened. 3. Add the chicken and continue to sauté until the meat is partially cooked. 4. Add the konnyaku shirataki, shiitake, and carrot. Stir well. 5. Combine the dashi stock, sake and soy sauce, and pour this mixture into the donabe. 6. Cover with the lid. Bring to boil, then reduce the heat to medium-low. Simmer for 7-8 minutes or until everything is cooked through. Skim as necessary. 7. Serve into individual bowls. Garnish with the scallion and sansho pepper.